TSA regulatory requirements state that airport operators must show control of all the access points in their air operations area (AOA). For most airports, this means securing hundreds of remote access points and managing access for hundreds of key holders. Recent threats of insider theft by personnel add another layer of concern for airport operators. 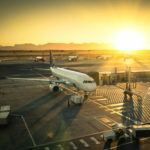 When an airport ensures they are meeting regulatory requirements for access points like manual vehicle gates, it becomes critical for them to find a high security solution that can be integrated into an existing card reader hardware. With dozens of miles of AOA restricted fence line, any hard-wired system would not be cost-effective. The CyberLock Flex system is the only access control solution that offers both hard- wired and key-centric technologies within one software package. With the Flex system, an airport can keep their existing card reader hardware, while also securing hundreds of remote access points with CyberLock padlocks. One security administrator at an international airport in the southern US gave 251 maintenance workers, police, fire fighters, guards and FAA employees CyberKeys with short expirations. This gave them increased key control by requiring employees to update their keys often. This also added an additional layer of theft prevention by utilizing short access permissions to make it difficult for keys to be passed around to employees who should not have access to restricted areas. Airport Security Administrators now have the ability to view reports that show who accessed specific vehicle gates and remote areas, keeping them compliant with TSA regulatory requirements. The CyberLock Flex System can give them this ability without having to change the access control system they already have in place and without hard-wiring miles of remote access points, saving a great deal of money. "The CyberLock Flex System can give them this ability without having to change the access control system they already have in place and without hard-wiring miles of remote access points, saving a great deal of money."